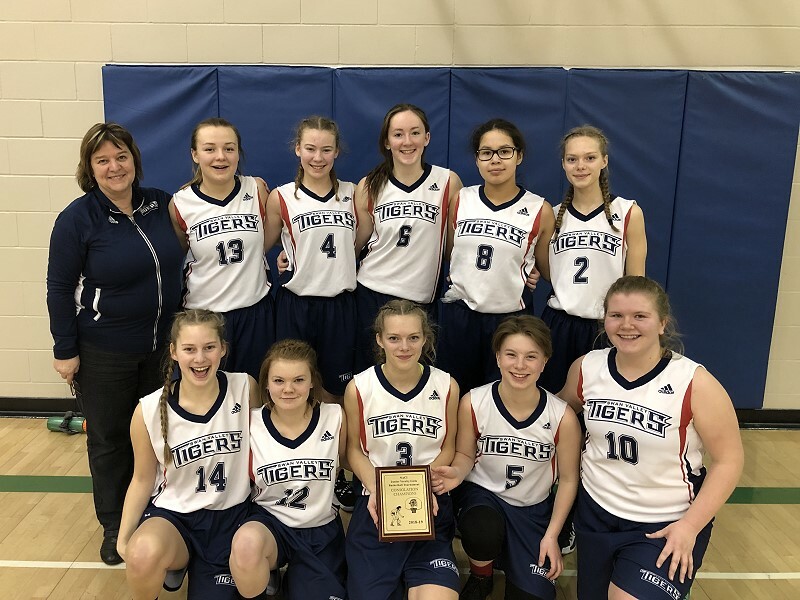 JV Girls played in the Neepawa Invitational Basketball Tournament on February 1-2, 2019. The first game of the tournament for the Tigers was against the Stonewall Rams. Once again the Tigers found themselves undersized but played a strong defensive game with a press, limiting their opponent to only 36 points. The Rams utilized an aggressive zone limiting the Tigers to mainly outside shots. The final outcome of the game was a win for Stonewall 36-25. The player of the Game for the Tigers was Ali Kujanpaa with 9 points, four steals. The Players of the Game awards for the tournament were selected by the Coach of the opposing team. The Tigers played in the semi-final against The Pas on Saturday morning. Both teams played a physical, fast game and the score was close through the first two quarters. In the third quarter the Tigers built a lead and by the end of the fourth quarter the score was 45-30 in favour of the Tigers. Scoring for the Tigers were Jasmine Rose and Kaitlyn Hunt with 10 points apiece, Sydney Gilroy with 9 points. The Player of the Game was Chloe Formo, with 6 points, five blocks and three steals. The Swan Valley Tigers played against the Neepawa Tigers in the Finals on Saturday afternoon. The Tigers started strong, stole the ball repeatedly while pressing and built an early lead of 20 points. This allowed the Tigers to control the game and gave them an opportunity to work on their outside shooting and post moves. Final score of the game was 62-12 for the Swan Valley Tigers. Leading scorers for the game were Jasmine Rose with 13 points, Chloe Formo with 12 points and Sydney Gilroy with 11 points. The Player of the Game for the Finals was Sydney Gilroy. The team was excited to bring home a plaque for the trophy case. Next action for the JV Girls is the Crocus Plains Tournament on Feb 15-16 in Brandon.